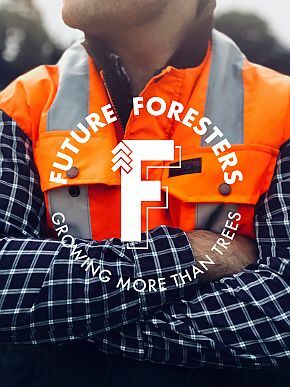 Future Foresters was conceived between a group of savvy young foresters during a well-lubricated conversation at the annual NZIF conference last year – aptly themed: “The Future of the New Zealand Forestry Sector”. Skills and labour shortages, the need for more trees, and forestry’s negative public image were just a few of the issues discussed. This, combined with the incredible opportunities us new recruits at the table had already encountered, meant we were left listening with an awareness of the problems but concerned for what we perceived was a lack of action. Future Foresters was born from the realisation that forestry’s perception needs to change. This perception issue is currently hindering the awareness of forestry as a viable career pathway for young New Zealanders and Future Foresters seeks to be part of the solution to change this. Although initially a conversation making light of the industry’s current situation (finding humour in difficult situations might be one of the best kiwi traits) we approached a few our more experienced NZIF counterparts in the room and the response to forming a young foresters group was thoroughly encouraged. From that slightly tipsy birth we have been working hard (and soberly…) to decide what we can do towards solving this issue and creating action. Our peers unanimously believe their futures in forestry look bright and promising (and we agree!). We are aware of the troubles forestry faces but we are also the ones who are likely to deal with consequences as we look 10, 20, and 30 years to the future. We are happy to own up to forestry’s shortcomings and want to be proactive and involved in coming up with innovative solutions. As millennials in the forestry sector we may have slightly different values to some of our more seasoned colleagues. This does not mean that we cannot learn from those who have gone before and it also does not mean that our views should be wholly discounted. At its truest essence it means that we need to work collaboratively to find our collective voice, specifically relating to the issue of connecting with the next generation of New Zealand’s forest workers and managers. We are going to give our best shot at promoting forestry for what it is by showing young New Zealanders the diverse and rewarding career opportunities that a modern-day forester has. We want to connect all young people, within the broadest sense of the industry, to create a nationwide community of young foresters. We want to link this community to the experienced and knowledgeable current foresters and facilitate knowledge sharing opportunities so the lessons of the past are not lost. We want to provide resources and guidance to get young foresters into schools to promote their story. And we want to be able to provide a friendly, relaxed environment where young foresters can get guidance on their career opportunities and have the chance to have their voice heard within the industry. Although we are all young and starting out, we want to give back. Already we are seeing payback from the industry and want to give that opportunity to any like-minded people searching for a career that is rewarding, dynamic, and has the ability to influence landscapes and environment alike. This is what attracted us to forestry – a passion for the environment, a respect for nature, a love of the outdoors, and a desire to be a driver for change –having a career with purpose, that is what millennials want. Future Foresters have been established as a special interest group under the NZIF. We are kicking off with an all-inclusive Quiz Night to be held at the Rutherford Hotel as part of the annual NZIF conference in Nelson (9th July, 7pm-late). We aim to provide an inviting and social atmosphere with an eye for facilitating important networking connections between the young and the not-so-young. This is a perfect opportunity to discover what Future Foresters is about (also it’s a free!). We will be looking for anyone who shares our passion and is willing to be involved to sign up. We will especially be looking for leaders to represent and organise regional Future Foresters groups and events. Anyone (at any stage of their career) is invited to show their support and encourage the next generation of foresters by becoming a mentor or by offering to lend support in any way possible. This will be the very first opportunity to get your hands on some much-anticipated Future Foresters swag and to showcase to the rest of NZ that you are part of this developing community. We employ anyone with an ounce of desire to promote the future of forestry to join us on the 9th of July and, if not, to support our cause, offer your advice, or simply encourage the young around you to be involved!! Registrations to the conference and the Quiz Night can be found here. And with all that being said we are working hard to create our online presence to engage and promote the industry. This begins with the hot off the press Future Foresters website launched today! Take a look, let us know what you think, and watch this space as we have many exciting developments and interesting opportunities in the works over the coming year.